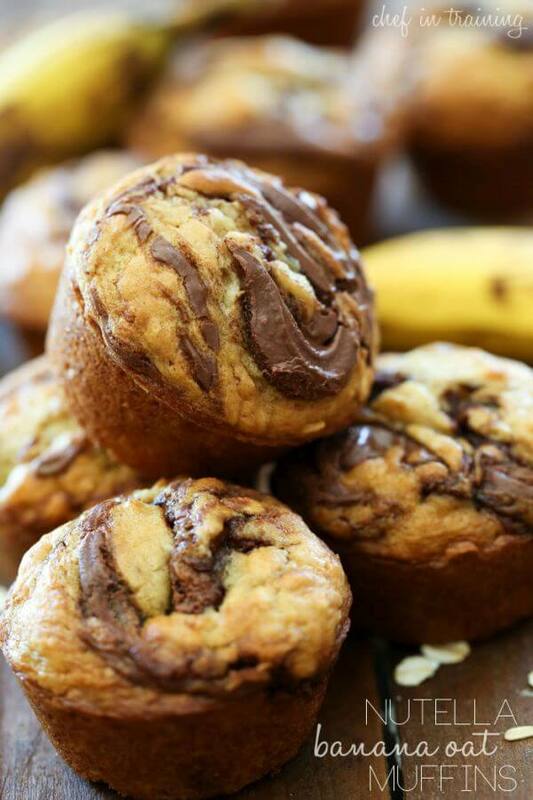 Love bananas but want some creative ways to harness their flavor? 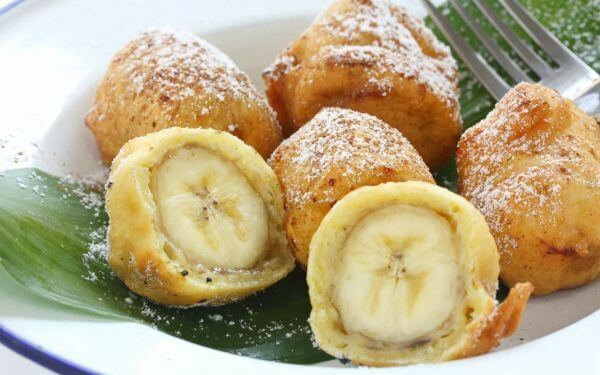 Check out these 20 cheap and easy banana recipes. Bananas are well-known as a great pre-workout or post-workout snack. 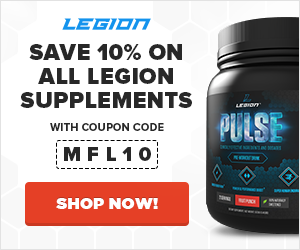 They’re packed full of potassium, manganese, copper, carbs, fiber and more, making them good for preventing muscle cramps and powering endurance activities. Let’s face it though–eating plain bananas day after day can get dull. Well, good thing they’re as versatile to cook with as they are portable! Whether you bake, fry, or mash them, they’ll soak up the flavor of both sweet and savory dishes, making them an ideal addition to your daily snacks or a healthy alternative for your nightly dessert. A quick way to turn a piece of fruit into a crave-worthy dessert is to slather on some Nutella. 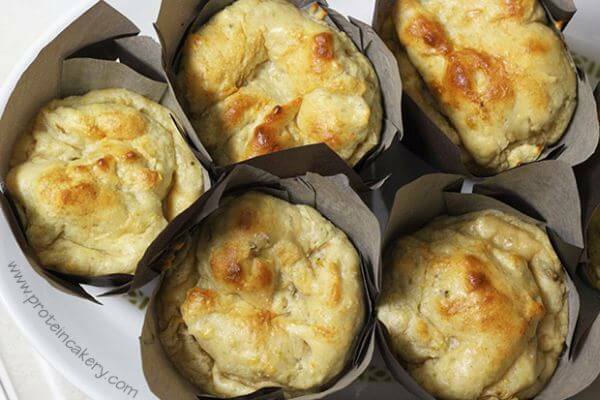 And if that’s something that speak to you and our taste buds, these muffins should be at the top of your must-bake list. 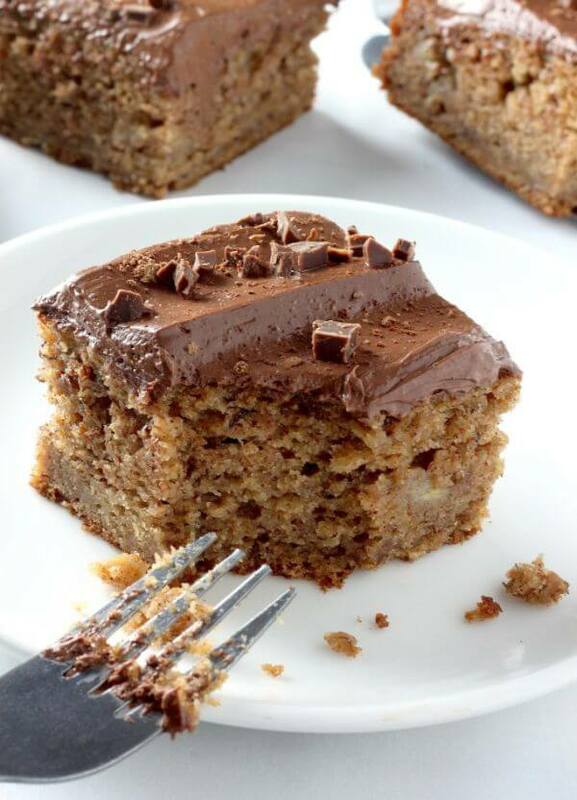 Want Nutella banana bread instead? Follow the same instructions, only prepare the batter to bake in a regular loaf pan instead. 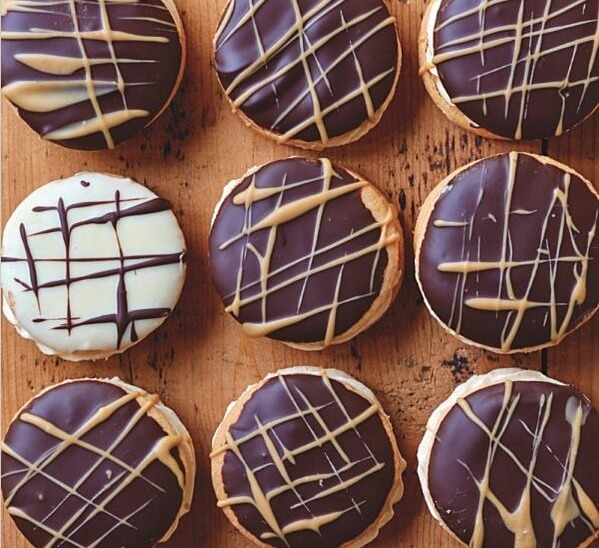 To really take these over the top, finish the banana sandwich cookies with not just the frosting but melted chocolate. Additionally, you can make a homemade butterscotch sauce by following another recipe within the cookbook. 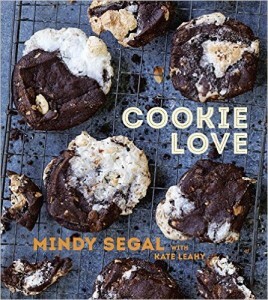 For everything from decadent banana cookies to simple chocolate chip, Cookie Love: More than 60 Recipes and Techniques for Turning the Ordinary into the Extraordinary is an unbeatable resource. 2 extra-large eggs, room temp. 1/2 cup butterscotch sauce, room temp. Can’t beat cravings for cake? With this recipe, you won’t have to feel guilty about eating your favorite dessert. To cut down on the added sugar and fat, this cake uses naturally sweet bananas and wholesome Greek yogurt. And you don’t need to skip the frosting either – this creamy chocolate frosting also relies on yogurt, plus cream cheese, to avoid the butter in buttercream. You’ll need just five ingredients to make these tasty bites, but you can add mix-ins like chocolate chips, dried fruit, and seeds to best suit your taste preferences as well as your meal plan. Many refrigerator cakes are made with nothing but chocolate wafer cookies and heavy whipped cream. Yet, that doesn’t mean the simple, no-bake dessert can’t be improved upon. 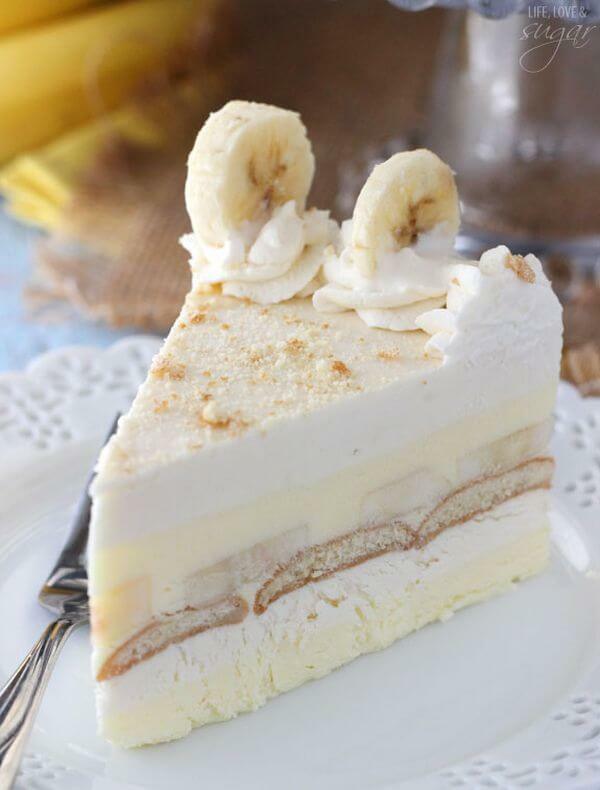 This one is a major upgrade from not just icebox cakes but banana pudding, covering vanilla wafers with two kinds of filling – vanilla and banana – both made with a mixture of cream cheese and heavy cream. To make pancakes, you only need a handful of ingredients. But when you want a mouthwatering brunch, there are endless ways to take pancakes to the next level. 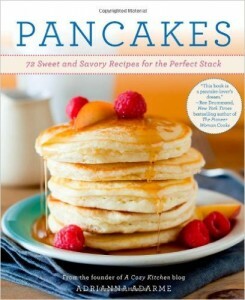 In fact, there’s over a year’s worth of weekend breakfast favorites – like these banana pancakes – in Adrianna Adarme’s cookbook Pancakes: 72 Sweet and Savory Recipes for the Perfect Stack. Buy banana bread at a bakery or café, and you’d be surprised how many calories one little slice can contain. But when you bake quick breads at home instead, you can fill the loaf with superfoods, and take steps to reduce the hit on your well-planned meal plan. 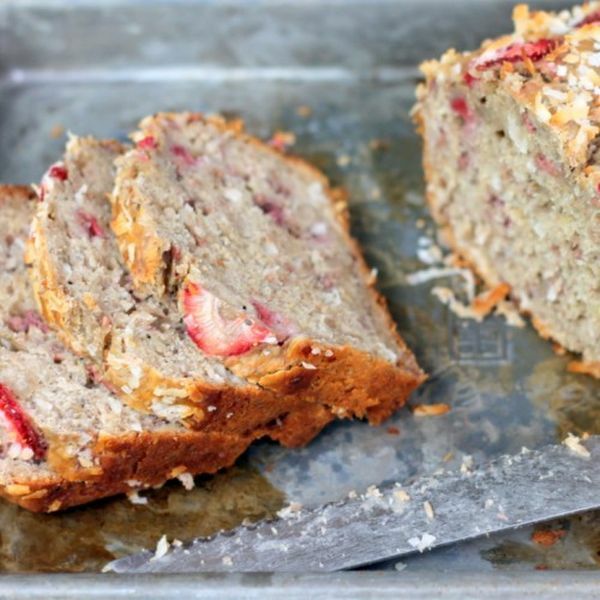 This strawberry banana bread isn’t just a great way to snack on fruit; it also includes chia seeds, coconut oil, and a bit of Greek yogurt. Not only are these cookies healthy, but you can make them with three easy-to-find ingredients. If you love to bake, chances are you already have what you need in the cupboard. 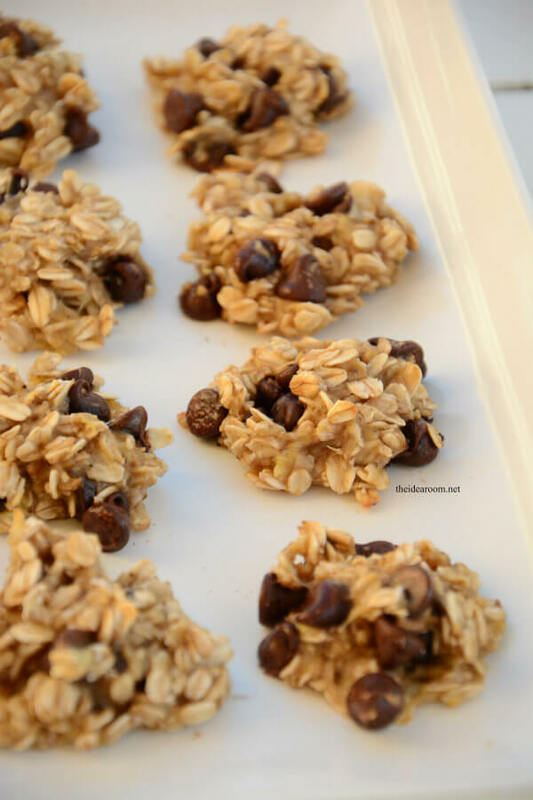 And if not, once you whip up a batch of these, you’ll be sure to keep oats and chocolate chips on hand so that you can be eating these in less than a half hour after the cookie craving strikes. 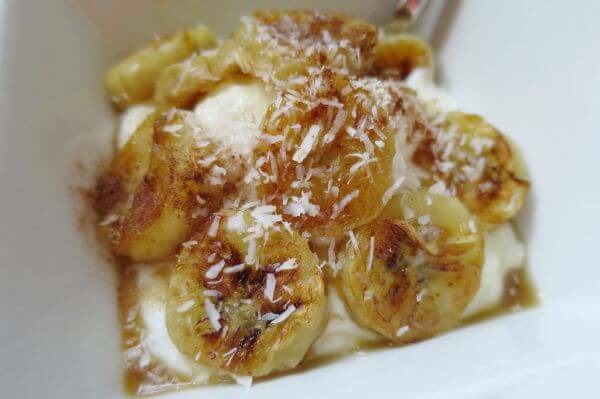 Banana desserts can be surprisingly heavy when laden with butter and heavy cream. Yet these cupcakes keep it light with cashew milk instead of buttermilk – plus a topping of delicious non-dairy buttercream. 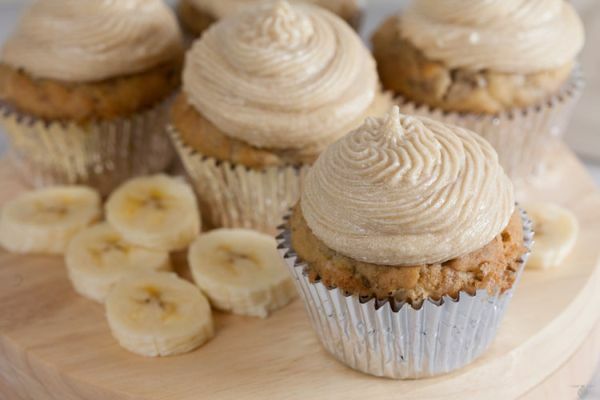 Keep this recipe on hand for birthdays to please the banana addict in the family, or if you love to bake healthy cupcakes when there’s no special occasion to necessitate the splurge. This cheesecake steals a page out of the banana pudding playbook. It starts with a crumb-based crust of vanilla wafers and pecans. 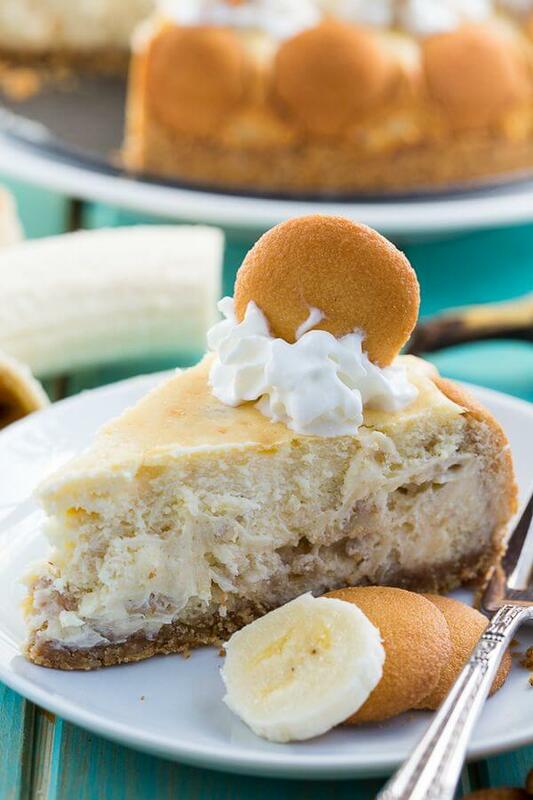 The cheesecake itself also includes ’nilla wafers, as well as expected ingredients like bananas, brown sugar, and cream cheese. For even richer flavor without adding calories, take 15 minutes to roast the banana that’s going to be mashed. Elevate Elvis’ favorite simple sandwich – peanut butter and bananas – by turning it into a healthy dessert. 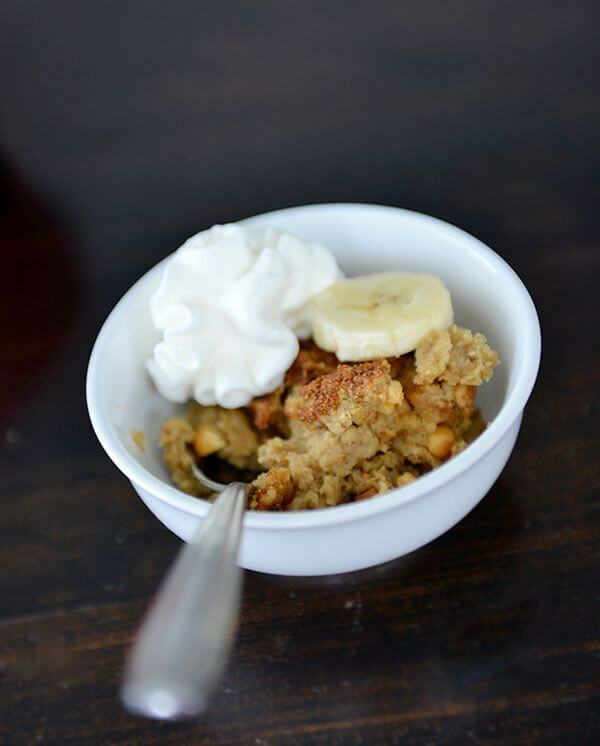 How can bread pudding be nutritious? By leaving out the bread, of course! Instead, this recipe uses protein powder and coconut flour to create the right texture. And it’s easy to make too. Mash the bananas, mix in peanut butter, and stir in everything else. Bake for 15 minutes, and serve warm. This recipe proves it doesn’t take much effort to make a healthy replacement for potato chips. Simply slice bananas real thin, dip them in freshly squeezed lemon juice, and bake at a low temp for a few hours. Then you’ll wind up with an awesome snack or nutritious dessert. And if you want to serve these like chips ‘n’ dip at a party, make a quick Greek yogurt sauce to go with. Yes, it’s possible to make homemade vegan “ice cream” from only frozen bananas, and you’ll get a spoonable desert that’s just as creamy. 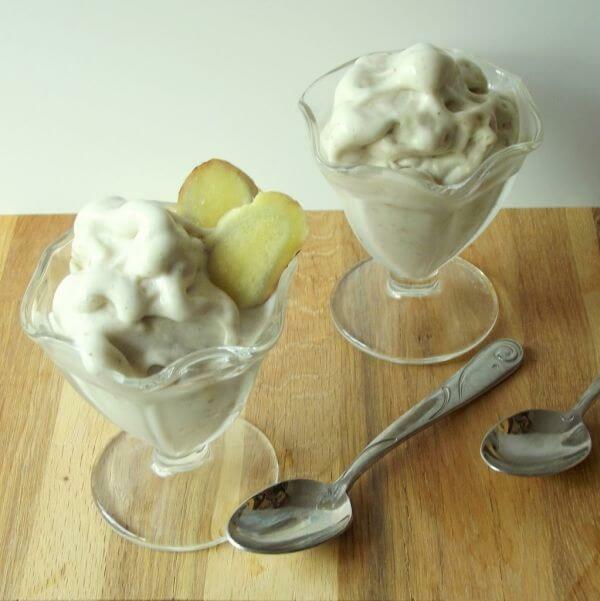 You hardly need a recipe for frozen banana ice cream because it only requires one ingredient. However, if you look around, you’ll find inspiration to make incredible flavors like peanut butter banana, chocolate banana, or this ginger banana frozen dessert. Keep your freezer stocked with frozen bananas, and you’ll be able to have delicious smoothies any time. You can use any frozen fruit to create a nice thick shake – no ice required – but bananas are the creamiest by far. 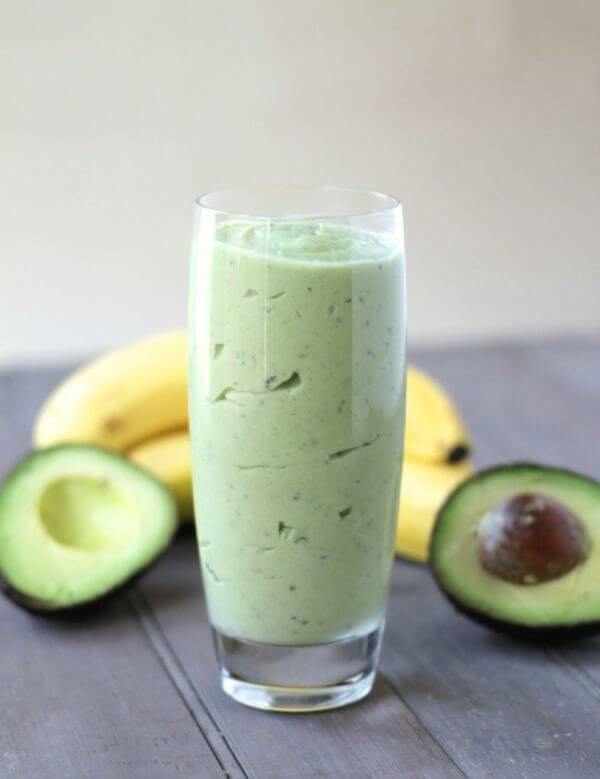 Then in this recipe, avocados make the smoothie extra rich and filling. Add a scoop of your favorite protein powder, and this becomes a balanced meal, or a great way to refuel post-workout. Caramelized bananas are so delicious, it doesn’t take much more to make a nutritious dessert. When you sauté banana slices in olive oil, the natural sugars in the fruit transform into a sticky syrup. 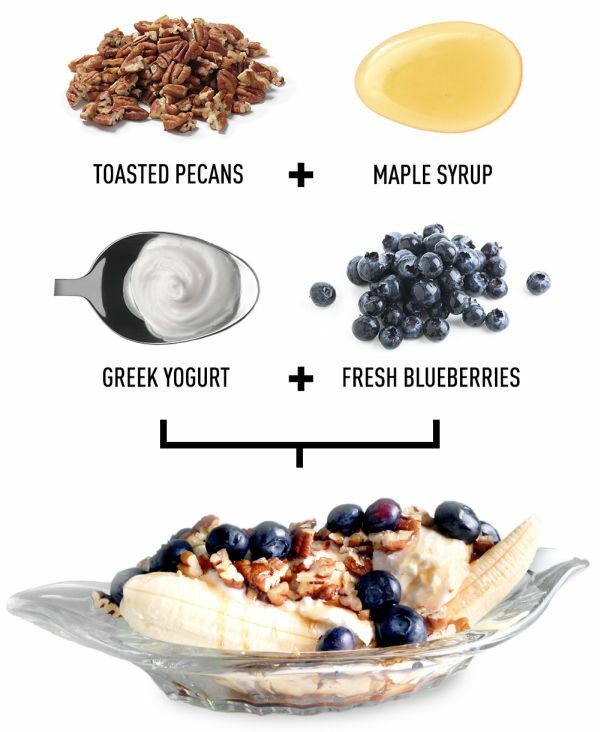 Then it only takes a touch of honey and a bit of seasoning to turn the bananas into a great Greek yogurt parfait. It’s better than the flavored banana yogurt you can pick up in stores and has less added sugar. Snacktime doesn’t get easier than this banana sushi, and yet the finished dish looks like it took some work to assemble. 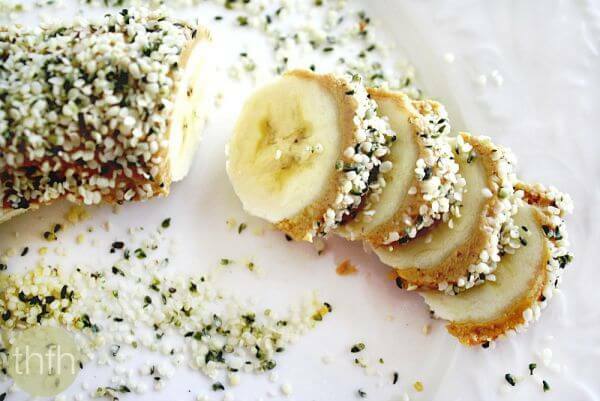 Really all you have to do is cover a banana in peanut butter, and then roll the whole thing in hemp seeds. This is also easy to adapt to whatever ingredients are in your pantry, such as almond butter and a mixture of other seeds. However, hemp seeds are preferable since they add a good amount of plant-based protein. Just because bananas are naturally sweet doesn’t mean they have to be made into desserts. 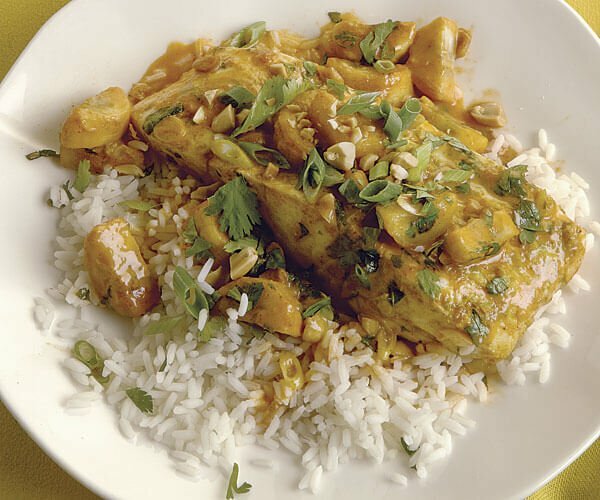 In this Thai curry, bananas become a tasty savory dish to have with halibut. And believe it or not, you can have this dinner for two on the table in just 15 minutes, making this a unique weeknight dinner to remember. 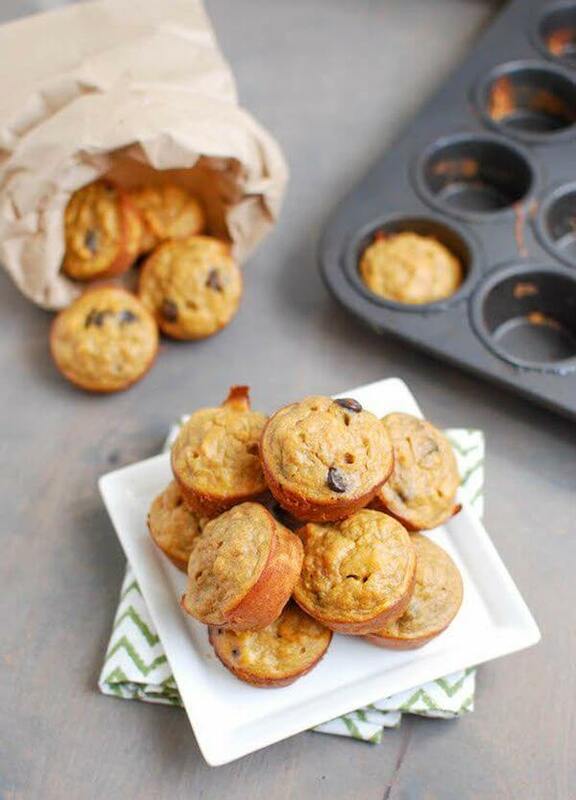 This makes one small cake, or for portion control, you can also bake the batter into six banana cupcakes. But with macros like these, it’s not hard to make room for a second helping. After all, you’re adding nearly as many grams of protein as carbs – and hardly any fat, which is from the minimal amount of coconut. Here’s a killer brunch idea that’ll have everyone at the table going bananas. Instead of just having a piece of fruit to start your morning, lighten up the usual banana split into a breakfast sundae. The ice cream can be substituted with any number of creamy alternatives: Greek yogurt, ricotta cheese, frozen yogurt, or coconut milk ice cream. Then pile on your favorite toppings, steering toward the chopped nuts and fresh fruit. 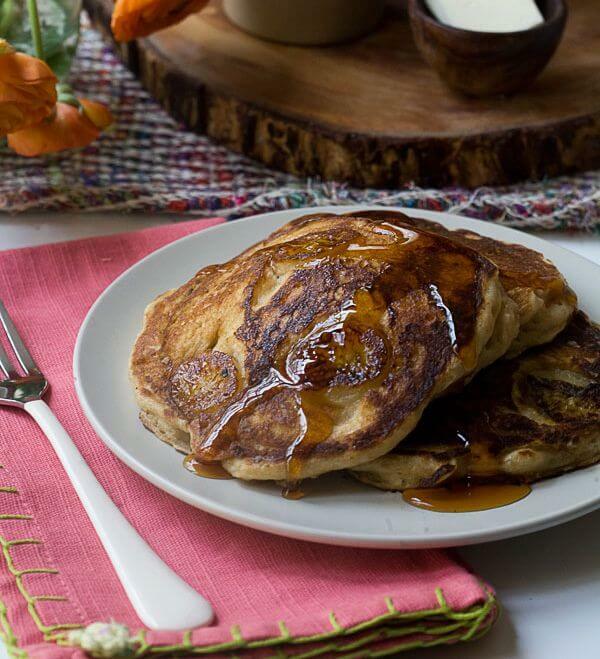 Instead of chocolate syrup, try a drizzle of natural sweetener like honey or maple syrup. These banana fritters surprisingly avoid taking a deep dive in sizzling oil by using an air fryer, thus cutting down the amount of fat. They’re also unique because the batter is made with multiple kinds of flour – as well as desiccated coconut and sesame seeds – to ensure a light, crispy coating. Of course, just all-purpose flour and a frying pan will work too, but it’s worth pulling out all the stops if you’re making a special dessert to follow a spicy curry or healthy Asian stir fry. 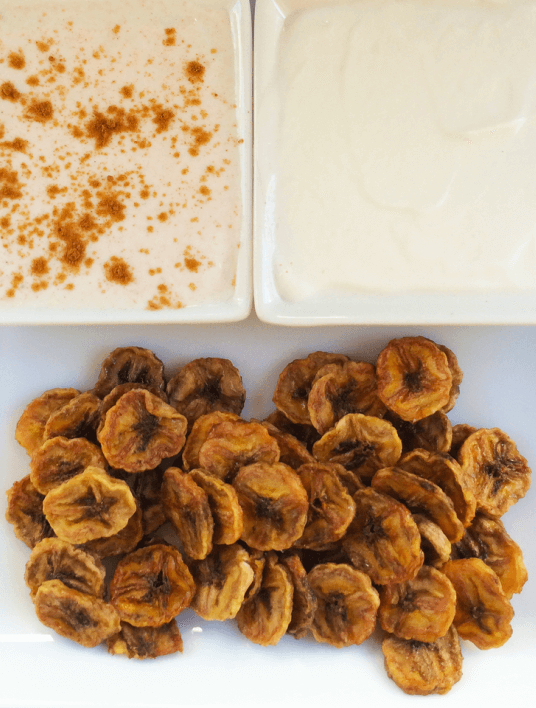 What did you think of these banana recipes? Have anything else to share? Let me know in the comments below!